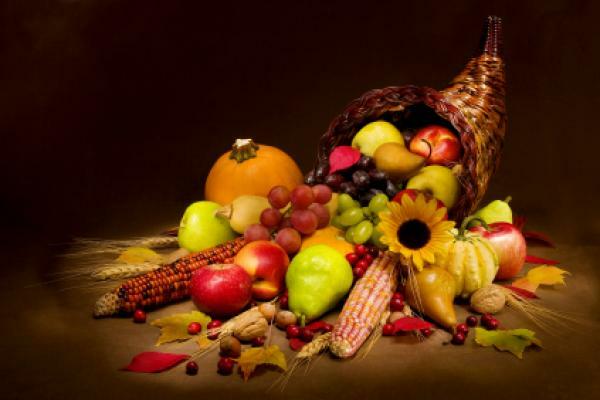 Both Veganism and Gluttony lead to Starvation: A Salutation to Thanksgiving. I take a few moments to reflect upon food, the God who made food for the body, and our Thanksgiving Holiday. “Now the Spirit expressly says that in later times some will depart from the faith by devoting themselves to deceitful spirits and teachings of demons, through the insincerity of liars whose consciences are seared, who forbid marriage and require abstinence from foods that God created to be received with thanksgiving by those who believe and know the truth. For everything created by God is good, and nothing is to be rejected if it is received with thanksgiving, for it is made holy by the word of God and prayer (1 Tim. 4:1-5; see also Romans 14 for a longer treatment on this subject). For some time now I have noticed that veganism is just as much of a spiritual approach to life as it is a dietary one. Most Vegan books, essays, websites, and restaurants, promote abstinence from meat as a spiritual pursuit, not purely dietary. I agree. We should not exploit animals. But eating them is not exploitation. It is enjoying a good gift from the one who made them. This helps us understand that part of the problem with veganism is that it does in the heart what God forbids: “Claiming to be wise they became fools, and exchanged the glory of the immortal God for images resembling mortal man and birds and animals and creeping things. Therefore God gave them up in the lusts of their hearts to impurity, to the dishonoring of their bodies among themselves, because they exchanged the truth about God for a lie and worshiped and served the creature (like in India where it is forbidden to eat a cow) rather than the Creator, who is blessed forever! Amen” (Romans 1:22-25). Whenever animals are elevated above man, that is a sure sign of God’s “giving up” man to his idolatrous heart. Veganism starves the soul because it does not point the way to the one who made all things for his glory, the one who sent Jesus Christ. It starves the soul because it preaches a false gospel that displaces Christ as the ultimate food for our lives (John 6). But secondly, there is another way to dishonor God with food. Scripture also says, “Whatever you eat or drink, do all to the glory of God.” 1 Cor. 10:31, and that self-control is a fruit of the Spirit (Gal. 5:22-23), and that you should put a knife to your throat if you are prone to over-eating (Prov. 23:2), and that gluttony is just as dishonoring and debilitating as drunkenness (Prov. 23:19-21), and that food is for the stomach and the stomach is for food but God will destroy them both (1 Cor. 6:12-13), and that gluttonous eating is not only dishonoring to the body but to others as well, because it says, “My insatiable appetite for food is more important to me than fellowship with you or with my Lord” (1 Cor. 11:17-34). Like veganism, gluttony starves the soul because it does not point the way to the one who made all things for his glory, the one who sent Jesus Christ. Gluttony starves the soul because it preaches a false gospel that displaces Christ as the ultimate food for our lives (John 6). Therefore, if you abstain from eating meat this Thanksgiving, do it to the glory of God because you know that God approves eating meat, but you choose not to because you’re trying to keep your body as healthy as possible. You do not believe that an ascetic approach to life is superior, nor do you believe that eating animals is a sin. But you choose a dietary approach to life that you believe will keep your body healthier for the long haul. If you do eat meat this Thanksgiving, do it to the glory of God because you know that fattening your body is not nearly as satisfying as filling your heart with what God has done for you in Christ: “O taste and see that the Lord is good” (Psalm 34:8). This means that you will not gorge yourself on the good food that God created to be eaten with thanksgiving. It really is hard to give thanks to God while you are destroying your body with over-eating and eating things that are truly harmful to the body. Remember, whatever you do, it is God’s grace that sustains you and gives you what you need to survive. May you enjoy good food from him who has blessed it, and may you enjoy even more, his Son who said, when nearly starving to death, “Man does not live by bread alone, but by every word that comes from the mouth of God” (Matt. 4:4). And now, I’m off to WV and will not post again until the first of December. It’s Deer Season! This entry was posted in Uncategorized and tagged food, Thanksgiving, vegan by ivanjamestruman. Bookmark the permalink.